Super top-end, very clean and detailed midrange. might lack warm as most of us are used to mid/woofer with more distortion. First off I want to thanks Jim Salk for lending me the HT1 for two weeks. Also not everybody tastes, setup and rooms are the same so my opinion might not reflect your experience with these speakers in “your” own room. Current Setup: Before getting into any comparison, my current setup includes Melody SP3, Denon 3910 with BG power caps changed and zapfilter analog stage installed and Onix Ref1. My previous speakers include B&W 602, CDM9NT, 805 Sig, AR.com DIY, and EFE T-36. Also some of the music that I used to evaluate both speakers: River of Sorrow, Burmester sampler CD III, Corrinne May fly away, Celine all the way SACD, Chapton unplugged & Norah Jones come away with me. In addition, my Ref1 is not really “stock” as it has sonicaps and BH5 installed. Finally, my room is 20x20x8 (stupid square) My Impression: When I first listed to the HT1, I thought the top end was really good but I did not like the midrange. Somehow the midrange was very clean, but too “clean”. It was lean sounding it made vocal sounded very “cold” or lack of “warmth” or emotion. I had one of my friend came over and his comments were the same. With all those positive reviews on Salk speakers how could not be true? I knew something had to be wrong. Finally I remembered that I had changed both 12AX7 tubes (to Ei)on the SP3 three weeks ago, and the purpose was to tone down REF1 midrange. After the put the stock tubes back into the SP3, the HT1 sounded way better than before. Vocals finally sounded “right” and yet very detailed. On Celine SACD, I could hear her voice right in the center hanging in the mid air and it sounded very clear and super detailed. The best I have heard in my room in term of image and details. As the midrange problem was finally solved, I was able to do some serious listening. On Chapton unplugged and river of sorrow, strings sounded real. It was the first time I heard string tone reproduced in my home that really sounded like strings! In summary, The HT1 sounded really balanced, nothing stick out. When I put the Ref1 back the ring tweeters sounded good, but not “real” and definitely not in the same class as the HT1. Vocal was also more forward then the HT1 along with more lower mid/upper bass. As such, the REF1 has a warmer sound and fewer details. Did I order the HT1? Nope as I am just trying to figure out which direction to go (monitor or floor standing). I definitely like the top end and the midrange detail of the HT1, but I also like the how the REF1 midrange as well, warm and forward. On well, I might even have to save up my pennies for the HT3 but I think my wife will kill me first before that happened. One last thing, the Salk HT1 is very revealing and it will expose what you have upfront. Voice, piano and acoustic music. It would be nice if they were a bit more efficient. 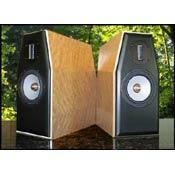 I was thinking about getting Ellis 1801 hand built speakers. The waiting line was too long from Ellis Audio so I was thinking about options. Jim Salk had a similar design and I could get a demo pair to audition. A guy in Dallas was reviewing the demos so Jim had him send me the speakers to review. I was blown away by the sound and the build quality. They were packed extremely well. The demos were on the bright side of neutral. They may be the best speakers under $10,000 for the voice and piano. The tweeter is so smooth that the speakers have warmth. The speakers have a holographic image and the experience on most music is similar to being in the studio. The speakers are flat until below 60 hz, but I would recommend a subwoofer. With 80 watts they went louder than needed before clipping in my medium sized room. A few more watts were needed for orchestral music played extremely loud in my medium sized room for headroom. I liked the shape of the front of the speakers so I had Jim build me a pair of HT1’s. I wanted fiddle back maple sides and zebrawood baffles. They turned out gorgeous! Jim said that he put more than 15 coats on the speakers. I paid for shipping the demos back to Jim. I have had one or the other speakers for about six months and am happier than ever with my purchase. I feel that it is my equipment that is limiting the performance of the speakers. There is one serious problem with my speakers though. Since I have had these speakers, the only thing my girlfriend wants to do is to come over and listen to cable’s Singers and Standards channel or my records. Cheap date! Equipment used: Proton 2631 preamp, Proton 2580 HT amp, Fisher 500 C FM receiver, Nottingham Horizon turntable, Sure V15xMR phono and Sony DVD player. I waited some time to post my thoughts on the Salk Sound Veracity HT1 speakers. I wanted to make sure that they were completely broken in as well as my amp(Panasonic XR45) which is also brand new. I stumbled across Jim’s web site one day and was blown away by the finish of the speakers he had displayed. I also liked the fact that Jim’s design incorporates the G2 ribbon tweeter. I had been looking for a new pair of speakers for some time and honestly was quite disappointed with the appearance of most in the market place. I was looking for a pair of speakers that sounded great but also looked great too. Every speaker that I actually liked the look of was incredibly expensive. Jim’s site mentions that he can basically create any type of finish combination that the customer requests. I decided to contact Jim via email. He always responded very quickly to any questions that I had. I explained to Jim that I’m not very crazy about the typical “Wood Finishes” that most manufacturers use. I also explained that I really liked an odd color that you never see on speaker finishes. This color is BMW Laguna Seca Blue. Jim never even blinked an eye at this. His response was “No Problem”. We just needed to decide on what to do with the front baffle of the speakers. Jim started the process rolling keeping me posted every step of the way. Once the cabinets were painted he emailed me several pictures of different types of wood that might look nice with this color(I thought the wood contrast with the gloss paint finish would look different.). Jim and I decided to go with “Highly Figured Maple”. He emailed me photos as soon as they were assembled, I was blown away. I received them in the mail a few days later. His packaging was absolutely the best I’d ever seen. I think the box could have handled a bomb blast. He explained to me that this was one of the first pairs he had ever done with a paint finish. They really came out great. Everything with Salk is professional all the way. Now to the sound…I hooked them up and let them play for a few days. I was really impressed by the sound that I was hearing. The first thing I noticed is how fast they are and how there is such a lack of noise. The bass is not booming nor did I expect it to be out of a pair of speakers this size. There is just something about these speakers that sounds “Right”. Jim also includes a setup disk that gives some nice samples of music and helps with speaker positioning. This is a very nice and professional touch. Well what else can I say…This was truly a custom purchase experience. I like the feeling that I was able to get exactly what I wanted not what the manufacturer “Offered”.